Draft: 2014, Kansas City Royals, 3rd rd. Eric L. Skoglund resides in Sarasota, Fla...Graduated from Sarasota High School (Fla.) in 2011… posted a 0.66 ERA during his junior season, the lowest in school history and lowest in the country in 2010…named Rawlings/Perfect Game All-America Honorable Mention in 2010... Attended University of Central Florida with Royals teammate Ben Lively…went 5-3 in 2012 to earn Louisville Slugger Freshman All-America honors… also posted a 9-3 mark and a 2.54 ERA as a junior, garnering American Athletic Conference Pitcher of the Year and unanimous All-AAC first team honors..Selected by the Pittsburgh Pirates in the 16th round of the 2011 First-Year Player Draft, but did not sign...Celebrated his 25th birthday visitng patients in the pediatric unit at the University of Kansas Hospital in Kansas City. 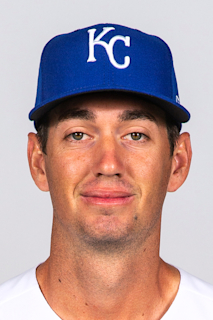 Made the Opening Day roster for the first time, but went 1-5 with a 6.70 ERA (37 ER in 49.2 IP) through his first nine starts, before being placed on the 10-day DL on May 26 with a sprained left UCL...Made 13 starts, most by a Royals rookie left-handed pitcher since Will Smith (16) in 2012...Completed at least 5.0 innings in nine of 13 starts, after doing it just once in five starts in 2017...Earned his second career win on April 28 vs. the White Sox (Game 2), in which he recorded a career-high nine strikeouts over 7.0 two-hit innings…became the first Royals southpaw to record 7.0 innings with two hits or fewer since Danny Duffy's club-record 16-strikeout game on Aug. 1, 2016 at Tampa Bay..Recorded a career-high 7.2 innings of two-run ball in a 2-1 loss on May 14 vs. Tampa Bay…matched the club record by a pitcher with six assists, joining: Steve Busby (4 times), Mark Gubicza, Charlie Leibrandt, Dennis Leonard, Mike McCormick and Paul Splittorff (once each)...Made five rehab starts, including one with Surprise, two with Northwest Arkansas (AA) and two with Omaha (AAA), in which he posted a 3.54 ERA (8 ER in 20.1 IP)...Reinstated from the 60-day DL on Sept. 4, after missing more than three months for the sprained left UCL...In five outings (4 starts) following his return, he posted a 1.33 ERA (3 ER in 20.1 IP) and .157 opponents' average (11-for-70), both of which ranked fourth in the American League (min. 20 IP) from his return date (Sept. 7), through season's end...Held opponents to three hits or fewer in each of his last four appearances-all of which were starts-the longest such streak in Royals history...Held Pittsburgh scoreless on three hits in 6.0 innings on Sept. 18 at PNC Park-his first scoreless start since his Major League debut on May 30, 2017 vs. Detroit-but took the no-decision in a 2-1 Royals loss... Recorded 2.1 scoreless innings in his next start, on Sept. 25 at Cincinnati, before a 51-minute rain delay ended his night...Issued two walks or fewer in 12 of his 13 starts…his 2.44 walk rate (19 BB in 70 IP) ranked second among American League rookies (min. 50 IP) behind Shane Bieber (1.81)...Held left-handed batters to a .196 average (9-for-46), but four of those hits were HR, including three in one game on May 25 at Texas. Spent most of the season in the minors, where he went 4-5 with a 4.07 ERA (47 ER in 104.0 IP) in 20 starts between Northwest Arkansas (AA) and Omaha (AAA) ... Made his Major League debut on May 30 vs. Detroit, recording 6.1 scoreless innings in a 1-0 win over Justin Verlander…he's the 10th Royal to start and win his Major League debut, and his 6.1 scoreless innings marked the third-longest scoreless start by a Royal in his debut ... According to Elias Sports Bureau, he's the third starting pitcher, in his Major League debut, to win a 1-0 over a former Cy Young Award winner, joining Steve Woodward (July 28, 1997 over Roger Clemens) and Lee Tunnell (Sept. 4, 1982 over Fernando Valenzuela) ... Made two more starts in the Royals' rotation, allowing six runs on 11 hits and four walks over 3.1 innings, and was optioned to Omaha on June 19 ... Had a 3.79 ERA (24 ER in 57.0 IP) in his next 11 starts with the Storm Chasers, including a season-high tying nine strikeouts in his last two starts in the minors on Aug. 10-15 ... Recalled from Aug. 19-28 and made one start on Aug. 27 at Cleveland, in which he allowed seven runs on seven hits and two walks in 1.1 innings ... Optioned on Aug. 28 but was recalled the next day and spent the rest of the season with Kansas City…allowed seven runs (six earned) in 7.0 innings across his last three appearances (one start). Spent the entire 2016 season at Northwest Arkansas (AA)…named a Texas League postseason All-Star ... Led the league in strikeouts (134) and innings pitched, while tying for the lead in starts in 2016…also ranked third in WHIP (1.11) and seventh in ERA among qualifying hurlers ... Matched a career-high with 10 strikeouts over 6.0 scoreless innings on Aug. 12, 2016 at San Antonio, taking a nodecision in a 1-0 Naturals win…marked his second doubledigit strikeout performance, also doing it May 16, 2015 with Wilmington (A) at Lynchburg. Made 15 starts with Wilmington in 2015, going 6-3 with a 3.52 ERA (33 ER in 84.1 IP)…named a Carolina League All-Star, tossing a scoreless fifth inning ... Missed the last seven weeks of the season, being placed on the disabled list on July 20 with a right elbow injury…at the time of his injury, ranked 13th among qualifying Class A pitchers in WHIP (1.11) ... Threw an 8.0-inning complete game, a 3-1 loss at Potomac on May 29, 2015…allowed three runs on 10 hits with a walk and three strikeouts. Spent his first professional season at Idaho Falls (Rookie), going 0-2 with a 5.09 ERA. March 28, 2019 Kansas City Royals placed LHP Eric Skoglund on the restricted list. September 4, 2018 Kansas City Royals activated LHP Eric Skoglund. August 2, 2018 Kansas City Royals sent LHP Eric Skoglund on a rehab assignment to Omaha Storm Chasers. July 23, 2018 Kansas City Royals sent LHP Eric Skoglund on a rehab assignment to Northwest Arkansas Naturals. July 18, 2018 Kansas City Royals sent LHP Eric Skoglund on a rehab assignment to AZL Royals. June 17, 2018 Kansas City Royals transferred LHP Eric Skoglund from the 10-day disabled list to the 60-day disabled list. Left UCL sprain. May 26, 2018 Kansas City Royals placed LHP Eric Skoglund on the 10-day disabled list. Left UCL sprain. August 29, 2017 Kansas City Royals recalled LHP Eric Skoglund from Omaha Storm Chasers. August 28, 2017 Kansas City Royals optioned LHP Eric Skoglund to Omaha Storm Chasers. August 19, 2017 Kansas City Royals recalled Eric Skoglund from Omaha Storm Chasers. July 3, 2017 Kansas City Royals optioned LHP Eric Skoglund to Omaha Storm Chasers. June 30, 2017 Kansas City Royals recalled Eric Skoglund from Omaha Storm Chasers. June 22, 2017 Omaha Storm Chasers activated LHP Eric Skoglund. June 19, 2017 Kansas City Royals optioned LHP Eric Skoglund to Omaha Storm Chasers. May 30, 2017 Kansas City Royals selected the contract of Eric Skoglund from Omaha Storm Chasers. April 10, 2017 LHP Eric Skoglund assigned to Omaha Storm Chasers from Northwest Arkansas Naturals. January 7, 2017 Kansas City Royals invited non-roster LHP Eric Skoglund to spring training. April 6, 2016 LHP Eric Skoglund assigned to Northwest Arkansas Naturals from Wilmington Blue Rocks. September 28, 2015 Wilmington Blue Rocks activated LHP Eric Skoglund from the 7-day disabled list. July 20, 2015 Wilmington Blue Rocks placed LHP Eric Skoglund on the 7-day disabled list. Right elbow injury. April 8, 2015 LHP Eric Skoglund assigned to Wilmington Blue Rocks from Idaho Falls Chukars. June 15, 2014 LHP Eric Skoglund assigned to Idaho Falls Chukars. June 10, 2014 Kansas City Royals signed LHP Eric Skoglund.